Monopoly Mega Movers is a video slot game of 5 reels and 30 paylines powered and backed by WMS software platform. Coin sizes for this slot starts just from 50p per spin to €£75 per spin. Total coins in this game can be 30. The slot offers a jackpot of 2,000 times of your total bet and it has 3 bonus rounds as well for the players like you, where you could get 5 to up to 100 free spins and up to 10x of multiplier. This is a highly payble slot game by WMG Gaming. You can check out Monopoly Mega Movers slot game with the help of your desktop, mobile or tablets at any WMS casinos for real money. As mentioned, this slot covers three bonus rounds. You will find 5 fixed jackpots, up to 12 wild spin bonus features and a whooping up to 100 free spin during Free spin Bonus Feature. Monopoly Mega Movers slot is a quite simple game which is being set against a backdrop of blue background. 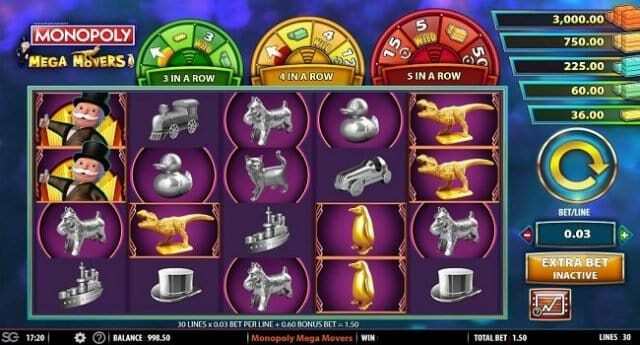 The reels of this slot contains symbols car, train, top hat, dog, cat, ducky, penguin, T-Red and many other things. The symbol i.e. Mr Monopoly is the highest paying symbol in this game, which would offer you 5 times of your total bet if you land 5 of these symbols across a payline. The game includes wild symbols as well, which can replace all other symbols on any active reel except the scatter symbols but the wild only appears on the 3 middle reels of this game. If you hit 3 wild symbols in a Row wheel then you will get a chance to ‘Upgrade’ and will also receive 1 free spin of the 4 in a Row wheel. 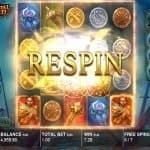 This will also trigger free spin feature, and that feature will offer you displayed number of free spins. 3 wilds in a row can win you Mini (24 times of your total stake) or Minor jackpots (40 times of your total stake). 4 in a Row Wheel option will give you ‘Upgrade’ option and 1 free spins of the 5 in a Row wheel + you can trigger Free spin Bonus Feature and the number of free spins will be displayed at your window + You can win Minor and Major jackpots also in this feature. The Minor jackpot will give you 40 times of your stake and major jackpot will give you 150 times of your total stake. The next thing is 5 in a Row wheel and in this feature; you will able to recieve1 free spin and could get Major (150 times of your total stake), Mega 9500 times of your stake) or Grand Jackpots (2,000 times your stake respectively). Give Monopoly Mega Movers slot a try because it is one of the best slot game from the makers of WMS software platform. 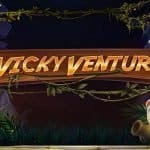 This is one of the most played online slot game these days you should take a look. 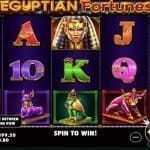 You can play this slot at any of the site of the site listed here at uk online casino.